Who doesn't love some stocking stuffers? The stockings are one of my favorite parts of Christmas. I think I like the challenge of finding things small enough to fit into the stocking that are fun and affordable. Though I often have to take a gift or two out and wrap it for being too big or the stocking being too full. 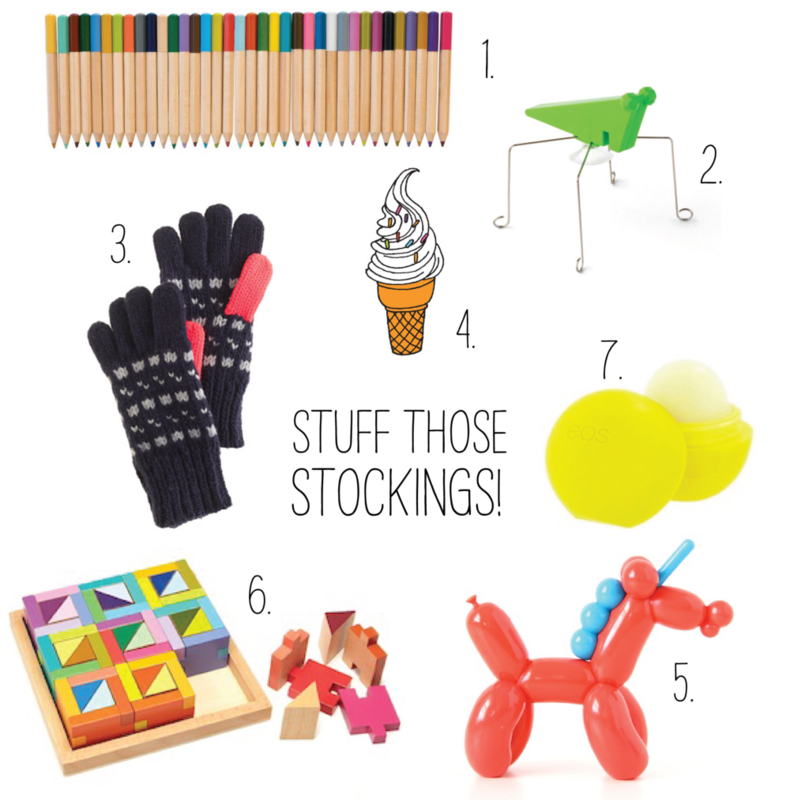 Here are some fun stocking stuffers we are loving this year! Check them out and happy stuffing! 1. Mini Colored Pencils - We have these and love them. They are the perfect size for the stocking! 2. Jumping Grasshopper - Elliott is getting this in his stocking (shh) and I may or may not have played with it for a good 20 minutes the other day. 3. Sweet Gloves - some gender neutral gloves are always a win in the stocking 4. Temporary Tattoos - We are obsessed with temporary tattoos! Tattly has some pretty awesome ones. 5. Plastic Balloon Unicorn! - I am sure you remember this little guy. They are the perfect size for the stocking. 6. Puzzle Blocks - Admittedly, these would most likely be too big for the stocking. But look at them! How can you resist? 7. Lip Balm - This is a new favorite of ours. Elliott loves the shape and I love what it does for his chap little lips.